Parenting Styles vs. Family Time - Good Parent Inc. 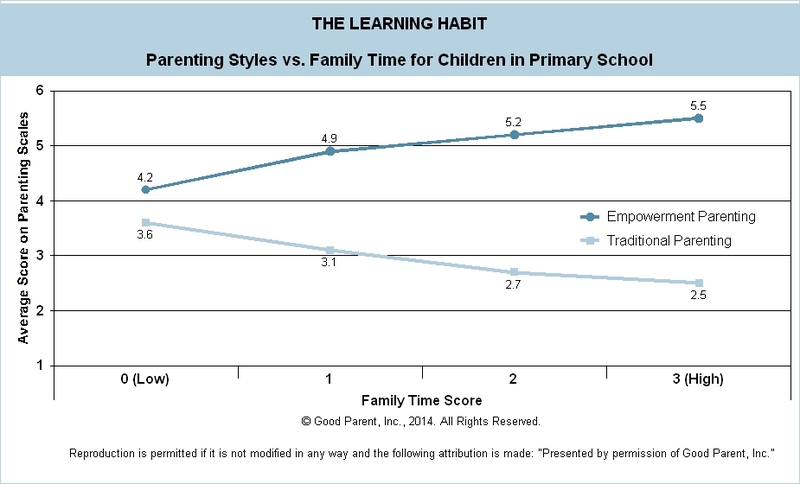 In the Learning Habit Study, we examined Parenting Styles and Family Time. Parenting Styles were broken down into two categories. Traditional Parenting places emphasis on correcting or punishing unwanted behavior. It was also characterized by reduced communication between parents and with the child. Empowerment Parenting included a productive flow of communication among parents as well as with the child and a measure of confidence in the child’s capacity to make appropriate choices. Family Time included family dinners, board games and attending religious services. 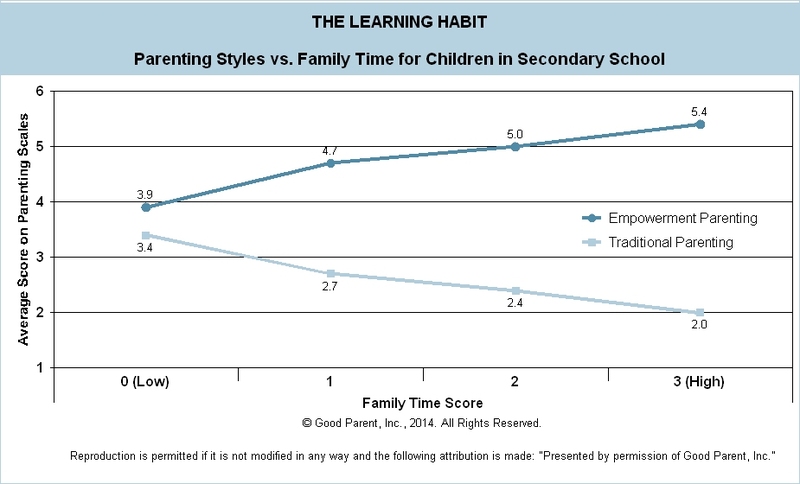 Across all grade levels, parents who indicated high rates of Traditional Parenting techniques also indicated low Family Time scores. Conversely, parents who indicated high Empowerment Parenting techniques indicated high Family Time scores. Increased Family Time and Empowerment Parenting styles not only promote better, healthier childhood outcomes; but they do so in stark contrast to alternative models such as Traditional Parenting styles. In short, spending more time with children in meaningful family interactions while promoting positive reinforcement will help to foster better environments for learning and ultimately more successful children. The greater the amount of family time spent, the more positive the results for a child. Almost one in every five children who participate in family time routines experience less total screen time. Further, youth tend to show lower emotional instability and less inconsistency in time management skills. There was also a slight increase in positive socialization skills for youth who participated in family time although this decreases as the child ages reflecting the reduction in Family Time activities once children enter secondary school and become increasingly more independent.